Mentors for Rent is a team of two established children’s book writers who between us have decades of experience as writing teachers, coaches, and conference presenters. In 2011 we decided to collaborate as Mentors for Rent, and since then we’ve helped numerous writers take leaps forward in their children’s book writing careers. At the moment, only Lisa is available for individual coaching/critique sessions (feel free to contact her here). But we have also created several other resources based on the feedback that our clients have told us has been most helpful to them. 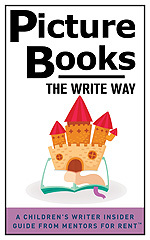 Check out our Children’s Writer Insider Guides and our Writing for Children video courses. Want to build a career? Disclosure: When you click and buy from IndieBound or Amazon, Mentor Laura earns a tiny fee that does not change your purchase price. Laura does book research on Amazon but encourages buying books through IndieBound or your local indie bookseller!